What an incredibly fascinating novel. In some ways the very notions discussed in this book are as tempting as eating the fruit of the tree of the knowledge of good and evil! I often wondered if I should linger longer in its pages or put it down altogether. Yet, the story bids me continue. The reader will not agree, at first or at all, with Elliott’s portrayal of Eden, God, Lucifer or the characters of this worlds first family. Each chapter compels the reader to return back to the scriptures wondering if what has been stated in this book is a legitimate interpretation of the scriptural account. Then again, this is a novel. Does it need to be ‘accurate’, or merely a spin off the old, old story? Certainly this rendering of Eden and this world’s first family challenges many of my long held notions. Another teasingly curious attribute of this story is the projection of 21st century cultural experiences into the thinking of the first years of creation. Is Elliott actually writing herself into Eve – the first woman, wife, and mother? Or, was she intending to connect any woman with Eve? Though there are many theologically confrontative issues in this book, if we are unafraid of being challenged we will enjoy the throught provoking, emotionally titillating, and spiritually awakening rethinking of our human beginnings – in particular the woman we call Eve. As we have in recent years re-imagined Mary, the mother of Jesus, it seems only fitting that we re-introduce ourselves to Eve – the mother of us all. Teel Montague Cook music can be found at Teelcook.com and/or myspace.com/teelcookmusic. I enjoyed this album. I think that is because I like the more folksy guitar playing and the lyrics were easy to listen to. I played it as I drove for several hours. It was not intrusive, but rather soothing. I couldn’t say that the vocalist was my favorite, nor was all the music actually ‘good’ – as one might define ‘good’ these days. Much of the music reminded me of amaturish scripture songs I heard in the 70’s. Yet, despite this seemingly ‘harsh’ critique, I was blessed and think many others would enjoy this album. It will speak to you with authenticity, a feature not found in a lot of music these days. ReJesus is published by Hendrickson Publishers (2009). If you are not familiar with the authors, they have written some incredibly insightful books that challenge the church to get back to the mission it was called to. (The Shaping of Things to Come; Exiles: Living Missionally in a Post Modern Christian Culture; Forgotten Ways: Reactivating the Missional Church). In this particular book, the authors remind us that we cannot really be about our Father’s business unless we have a biblical conception of who Jesus was and is. We must ‘rejesus’ our thinking. This is clearly a discipline that ought to have been a no-brainer for Christians, yet has more often than not been neglected as we merely assume that the institution of religion has it right. Such is not the conclusion of the authors, and they outline why. Click on the title of this post to connect with the Shapevine site where you can read more info on this book – and order one for yourself! I like stories. When I watch a DVD or read a story I often find myself wondering how I would have responded within the narrative. Often the stories that others tell help me to better understand my own story. Eldredge not only puts value on our individual stories, but helps us to see how our personal stories is vitally connected to a much larger, eternal stories. This is a well needed reminder to all of us, particularly churches, that we need to keep the larger God story in mind at all times. To do otherwise is to reduce each day into a meaningless and stressful mess. Each of our stories, each day we live, can be best understood in the context of the whole cosmic narrative. There is much more going on around us, things that dramatically influence our personal stories. Without this insight we aimlessly and painfully meander through life unnecessarily. 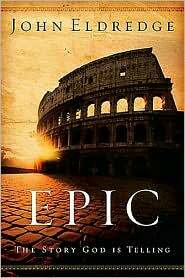 Epic (2004) brings us back into the larger picture. It is a book that ought to be utilized regularly in every discipleship and outreach effort. The handbook (2007) is also a useful guide for thinking through our own stories in the light of the larger Story. All in all, well done, well written, contemporary illustrations.